if you want to use Nmap 6.01 in metasploit do the following. Learn to penetration-test popular operating systems such as Windows7, Windows 2008 Server, Ubuntu etc. Master post-exploitation techniques such as exploring the target, keystrokes capturing, sniffing, pivoting, setting persistent connections etc. Use extension tools like Armitage, SET etc. 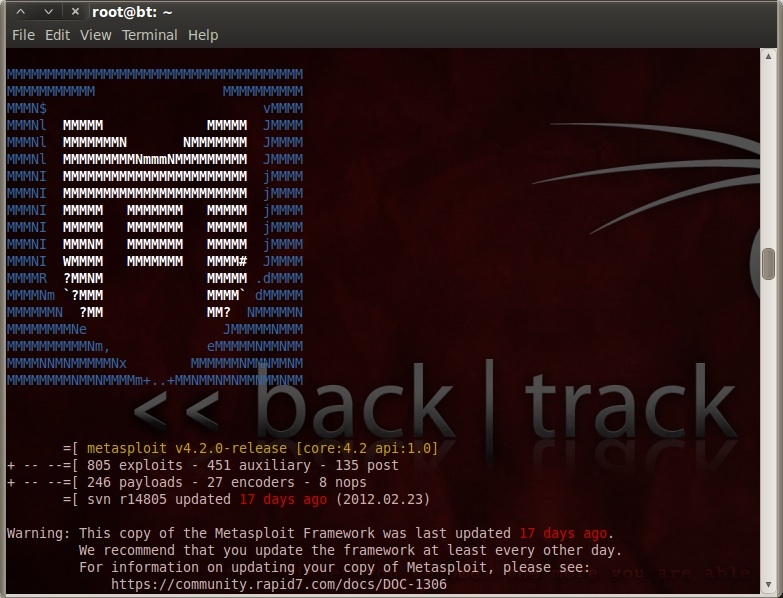 The Perl-based Metasploit was designed to be a robust exploit development system. It just so happens that you can use it to run previously developed exploits against your own systems. You can use its security testing features to see if your systems vulnerable to penetration and how they react when specific payloads are sent their way. 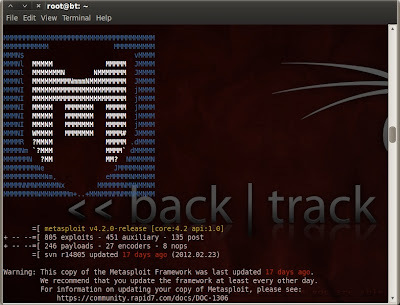 Outside of common Web application tests such as SQL injection and input tampering which are not supported, Metasploit has exploit code for a wide range of vulnerabilities in standalone applications, Web servers, operating systems, and more — 100 exploits and 75 payloads in version 2.4 to be exact. Version 2.5 was just released which, according the Metasploit site, includes bug fixes, cosmetic changes, and 32 more exploits! Even with over 100 exploits to choose from, obviously this isn’t enough to exploit every possible vulnerability in every penetration testing scenario you come across. But then again, the framework was built so you can write your own if you’re so inclined. In this installment, I’ll outline how to use Metasploit‘s built-in exploits and payloads in a real-world testing scenario. Be forewarned that it’s possible to create undesired results with this tool when performing your tests such as crashing or leaving production systems in an unstable state. As with any ethical hacking venture, proceed with caution and have a contingency plan in the event something goes awry. Please don’t take this lightly. Now that I’ve described the basic commands you’ll need, let’s take a look at some specific steps and screen shots required to carry out a real-world exploit. My test target in this example is a Windows 2000 Server system that has the MS05-039 plug and play vulnerability (CVE-2005-1983) that was exploited by the Zotob worm. This hole — which Metasploit happens to have an exploit for — allows arbitrary code execution including shell (command prompt) access to the system. I know my target system has this vulnerability because I discovered the problem with the vulnerability assessment tool QualysGuard. This is purely a part of an ethical hacking methodology, but it’s not required. You can blindly test your systems — or, even better — Metasploit can do some of the legwork for you with its “check” function to see if a system is vulnerable before exploiting it. More on this below. My testing system is a Windows XP SP2 system running the Metasploit Framework version 2.4 I downloaded and installed. I’ll use Metasploit’s most commonly used msfconsole interface to demonstrate this attack. Note: At this point you can enter show exploits to see which exploits are available for your target system. I enter show options one final time to make sure everything is set correctly and then entercheck to confirm that my target system is indeed vulnerable to the ms05_039_pnp vulnerability. You can imagine what could happen at this point if a malicious hacker compromised your system in this way. That’s why it’s so important to “hack” your own systems first so you can find and plug the holes before the bad guys exploit them. This exploit is just one example of what can be done using Metasploit during penetration testing. The good thing is that outside of the specific exploit and payload I used, most of the commands and techniques in this example can apply directly to other Metasploit-supported exploits. Once you’re used to how Metasploit operates, you’ll be glad to know that it contains several advanced features. You can save your “set” options, log your actions, and even define how each payload will clean up after itself once it’s done running. The neat thing about Metasploit is that it’s so powerful yet so easy to use. The msfconsole is very intuitive and help is always just a command away. I encourage you to play around with Metasploit in a test environment to see for yourself what it can do. It’s an enlightening proof of concept tool to say the least. 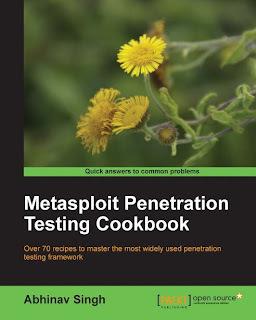 If you stay plugged into the Metasploit Project’s Web site, you can stay abreast of the latest framework and exploit releases. Apparently, a new and improved version of Metasploit (version 3) written in the Ruby programming language is due out soon, so be on the lookout for it as well. It pleases me that we’ve got such advanced tools like Metasploit at our disposal for the betterment of information security – especially for the low, low price of $0 in this case. These types of exploit tools will certainly play a vital role in the future of improving the overall quality of software, so the more you know about them the better. With a quick Metasploit download, easy install, and a few minutes familiarizing yourself with its interface, the future is all yours. 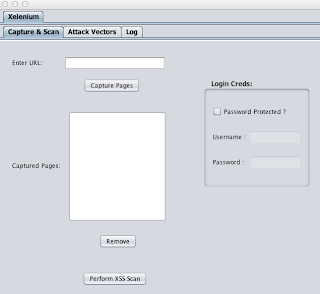 Xelenium is a security testing tool that can be used to identify the security vulnerabilities present in the web application. Xelenium uses the open source functional test automation tool 'Selenium' as its engine and has been built using Java swing. Xelenium has been designed considering that it should obtain very few inputs from users in the process of discovering the bugs. Current version helps the user in identifying the Cross Site Scripting (XSS) threats present in the web application. 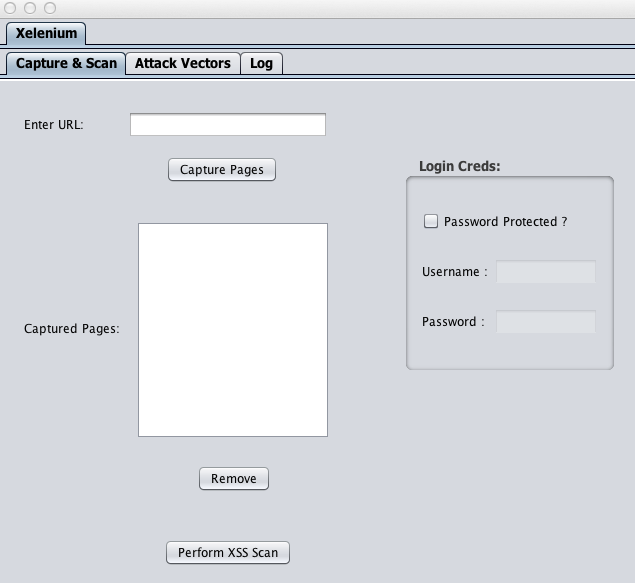 In the subsequent versions, Xelenium will be enhanced such that it could identify the other leading threats.